Welcome back for day 2 of Stamp Highlights with Friendship Sentiments! Let your tribe know how much they mean to you! Amy made a sweet card using the Flying with Friends, and the Friendship Sentiments. She used the Cloudy Day Cover to make a stencil to create the beautiful rainbow clouds. Laura combined the Friendship Sentiments set with the Photo Bomb set for this fun polaroid look. 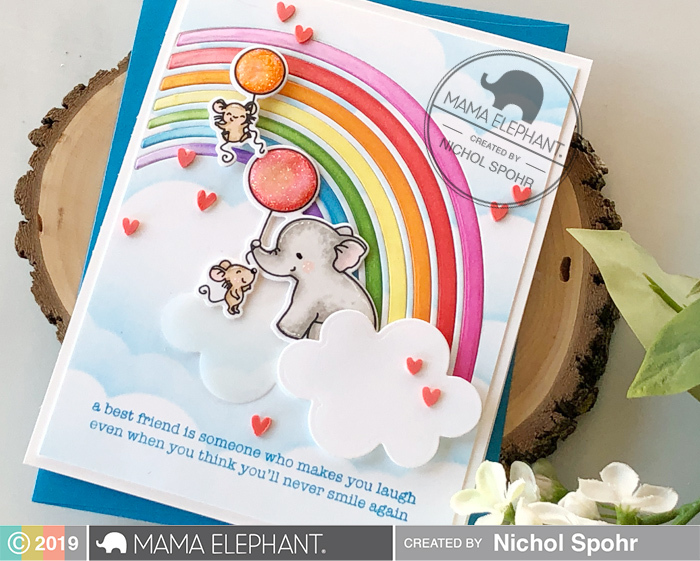 Nichol paired the Friendship Sentiments greetings with the Offset Rainbow Creative Cuts and Flying With Friends elephants for a happy scene card. Sweet friendship card by Vera, she paired it the with Girlfriends stamp set and the Hugs die from the Framed Tag - Hug it out Creative Cuts. Thi paired this 'girl power' sentiment from Friendship Sentiments with She's So Lovely perfectly! I love these cards SO much everyone!!!! I'm so happy I'd ordered those sentiments - they're all so great and you can just tell they'll make people smile when reading them on a card! Wow! Love these cards! The stamps and sentiments are so awesome! Beautiful cards. I love them all. Awesome stamps. Wonderful sentiments on these fabulous cards! These sayings are soooo Awesome!! And I adore these cards!!! the clouds in the first card.